When you go to the doctor or hospital, one piece of information that you're always asked to provide—in addition to your name, address, and insurance information—is an emergency contact. Often, that person is a blood relative. 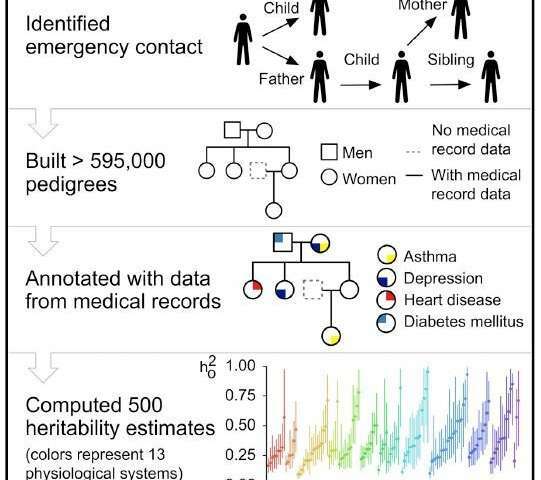 Now, a collaborative team of researchers from three major academic medical centers in New York City is showing that emergency contact information, which is included in individuals' electronic health records (EHRs), can be used to generate family trees. Those family trees in turn can be used to study heritability in hundreds of medical conditions. The study appears May 17 in the journal Cell. The three participating academic medical institutions were Columbia University Vagelos College of Physicians and Surgeons and Weill Cornell Medicine (both in conjunction with New York-Presbyterian Hospital) and the Icahn School of Medicine at Mount Sinai. Using an algorithm that matched up people's first and last names, addresses, and phone numbers—as well as how they were related to their emergency contact person—the investigators were able to identify 7.4 million familial connections.